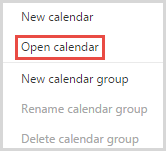 In the navigation pane, right-click the category where you want to add a new calendar view. In the From directory: box, type the name of the person or resource you want to add and then click Search directory.Note: Clicking search directory may not be necessary if you frequently communicate with that person or resource. 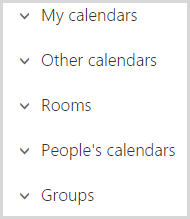 You can add as many calendars as you want to your view, but you can only view up to 10 at a time. If you have any questions, contact the IT Help Desk, helpdesk@k-state, edu, 785-532-7722.